For quite some time now, I've been working on planning and design stages of Guilded Age, a tactical RPG in the image of Fire Emblem, but with more modern themes and proactive inclusion of GRSM (gender, racial/romantic/religious and sexual minorities) characters. If you ever loved that series but kinda wished it was more progressive and diverse, rather than mostly white male monarchist reality, then this game will certainly be for you. This year I finally started getting out some concept art for the large roster of characters. 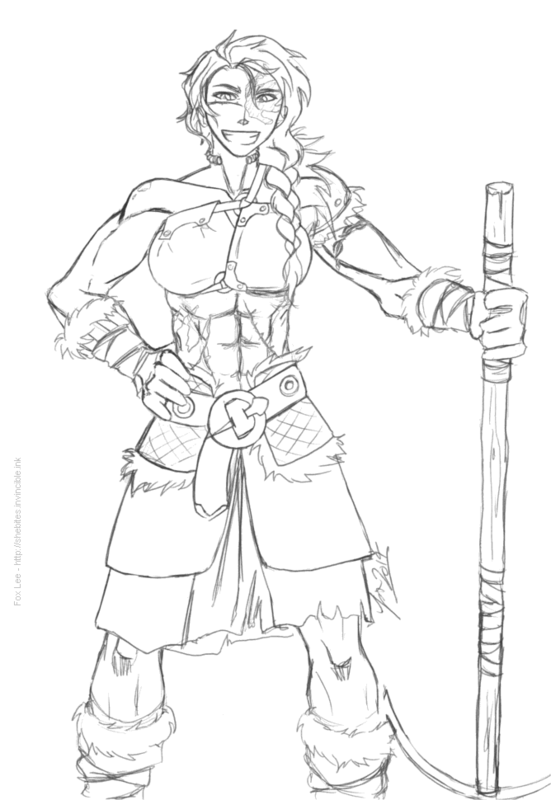 This one is Branagh, the loutish chief of the "Stonewall Clan" lowlander barbarians, and a pre-promote axe warrior. Appearing when the party first breaks free of the Guilded Cities, Branagh is a symbol as much as a person; a huge, gregarious thug of a woman who represents both the good and bad aspects of life outside the Guilds. Buttons and penicillin are for sissies, right? On a side note, I am not totally sure of her costume; the top half remains rather awkward, in my mind. Her face, however, is abolsutely spot-on.